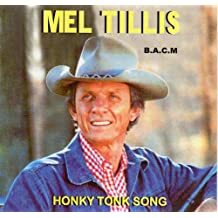 If you enjoy the older country music then it’s a almost a certainty you have Mel Tillis in your collection. He wrote a great deal of his songs and with other artists having the pleasure of recording many of them. If you have the opportunity go see him in concert as he puts on a tremendous show. Throughout the 1980’s he continued to record but had only sparingly top ten hits but still remained a popular songwriter especially with young artists. Mel is a great entertainer and what great music he provides us with, not to mention so many great classics that are such fun to play and sing. Mel is a tremendous success story, his great voice, song writing skills and his personality made him very successful. Us amateur guitar pickers can play many of his songs, they are pure country with great rhythm and simple chords, great for guys like me. We don’t have to be a good musician or vocalist to enjoy singing and playing music. Low prices on Mel Tillis Cds and easy to download MP3s .